People hold banners and wave Turkish flags during a meeting with the Turkish President as part of the campaign for the constitutional referendum, Ankara, March 29, 2017. 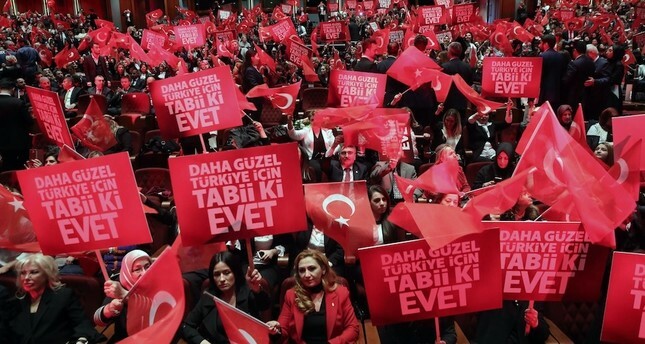 Turkey's political opposition has only one thing in mind: End Recep Tayyip Erdoğan's rule at all costs and prevent him from being elected as the head of the state in the June 24 polls. This has been their motivation for years now and so far they have always failed spectacularly. Even as they try to find a candidate who can halt the surge of Erdoğan, all they can think of is blind hatred, animosity and anger. Instead of trying to prevent Erdoğan's re-election, if they focused on coming to power they may have had a chance in the upcoming elections. President Erdoğan has a plan, a road map and an agenda for Turkey's future. His Justice and Development Party (AK Party) has ruled the country for 16 years as it oversaw Turkey's transformation into a relatively contemporary country, a rising star in the region. Does Turkey have flaws? Does Turkey have deficiencies? Of course, it has. Yet it is up to the opposition to pinpoint these deficiencies, bring it to the attention of the public and offer ways of overcoming them in a viable manner. The opposition should offer the nation projects as well as a road map suggesting what kind of a country we will have in the next decade. Yet the opposition parties have no such qualms. All they want is to topple Erdoğan and never see him again. That is a non-starter. The opposition is trying to gang up against Erdoğan and the AK Party and they are doing an extremely poor job. They first tried to come up with a joint presidential candidate to confront Erdoğan. They even went to the extremes of trying to convince former President Abdullah Gül to challenge Erdoğan. Gül, one of the founding members of the AK Party, a former President supported by the AK Party, a former prime minister and foreign minister under AK Party governments, initially seemed to warm to the idea of challenging Erdoğan and yet the opposition groups let him down. A group within the main opposition Republican People's Party (CHP) opposed Gül's candidacy. So Gül is now left in the political wilderness as a former leader, who has turned his back on Erdoğan and has been deserted by his new friends. The CHP itself is in complete disarray. It has struggled to find a candidate or even forge an alliance with other parties to be able to challenge Erdoğan. They are still trying, just as the Supreme Election Council (YSK) announced a rather tight elections schedule that affords little luxury for any party to play around. A complete mess. Then you have Meral Akşener's far-right Good Party (İP), which wants Akşener to be a presidential candidate and thus opposes Gül. This party is said to be supported by the Gülenists that tried to stage a bloody coup in Turkey on July 15, 2016. Last but not least, you have late Prime Minister Necmettin Erbakan's Saadet Party, now run by Temel Karamollaoğlu. Karamollaoğlu wanted to promote Gül as a joint opposition candidate and failed badly. He is being criticized within the Saadet ranks because Erbakan regarded Gül as a political traitor. Saadet is also under fire after it recently honored journalists known to be Erbakan's sworn enemies and actually helped the military topple his government in a 1997 coup. The Kurdish nationalist People's Democracy Party (HDP), widely regarded as the terrorist PKK's political wing, has become a political leper and despite CHP leader Kemal Kılıçdaroğlu's deep sympathy for the party, it has been left outside of any alliance. So on one side, you have the AK Party, in a well-organized, well-planned alliance with the conservative Nationalist Movement Party (MHP), while on the other you have an array of opposition parties that cannot get their acts together but have just one thing in common, enmity towards Erdoğan. No wonder they do not stand a chance to win power in the June 24 polls.